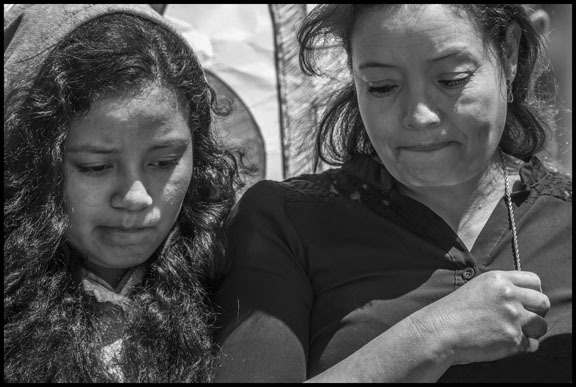 Family members of detainees, including Maria Lopez, Adrianna, and Hulissa Aguilar, called on ICE to release their loved ones after it was announced the center would close. Several former detainees, some freed just days before, came with their families to celebrate. Other families, however, faced the reality that their detained loved ones were now far away, in centers ranging from Adelanto in San Bernardino County to Arizona. Alexa Lopez’s father, Raul, was taken to a facility in Colorado. “We can’t see him anymore,” said his wife Dianeth. At the end of an hour of songs, prayers and speeches, the participants wrote messages on white ribbons to those still detained, and tied them onto the chain-link fence. ICE spokesman Richard Rocha accused those who had pressured the county of being responsible for separating families. 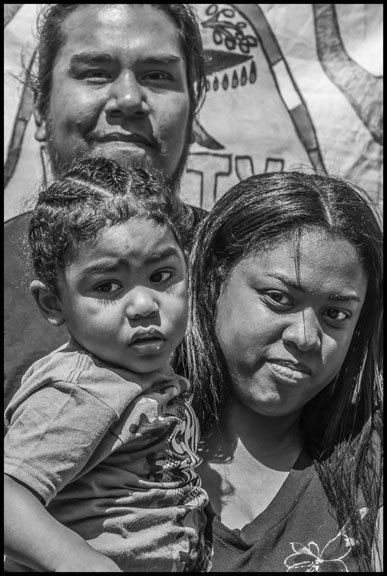 In a statement when the contract was canceled he said, “Instead of being housed close to family members or local attorneys, ICE may have to depend on its national system of detention bed space to place those detainees in locations farther away, reducing the opportunities for in-person family visitation and attorney coordination.” Immigrant rights activists called that a threat and tried to free as many detainees as they could. 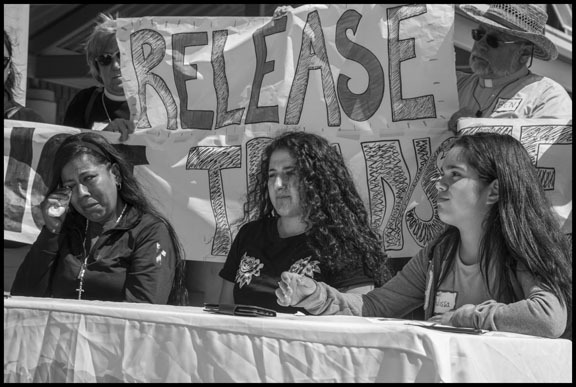 The ICE argument, that forcing the county to divest from cooperation in detention would harm the detainees, is similar to arguments heard during the fight for divestment from apartheid in South Africa. Corporations investing in South Africa at the time said divestment would harm those people who divestment proponents were trying to support. Opposing divestment, however, was then and is now also a matter of economic self-interest. ICE was paying Contra Costa County $3 million per year to house immigrant detainees. Yet the sheriff didn’t hire any new employees with the money, according to Lee. Instead his department relied on overtime by the existing workforce. In a petition a year ago detainees complained they were being held in cells 23 hours a day, that there were no toilets in the cells, and that free time for calling relatives or taking showers was often canceled. One detainee asked to be deported in preference to continued detention. ICE has facilities located in hundreds of county jails around the country, building a dependency among counties on the money paid for housing detainees. The city councils of Hoboken and Jersey City protested when Hudson County, New Jersey, supervisors (all Democrats) voted last July to renew its ICE detention contract. “The county and cities shouldn’t be in the business of profiting off human misery,” Jersey City Mayor Steve Fulop told the New York Times. Sacramento was receiving $6.6 million annually from ICE before it canceled its contract in June. Other contracts have also been canceled in Santa Ana, Virginia and Texas. 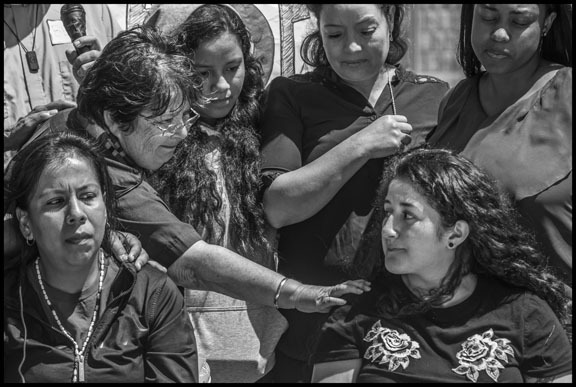 Supporters of Lourdes Barraza and her husband Fernando were able to raise the bond to get him released. He came to the next vigil to show support for other families, holding his youngest daughter. 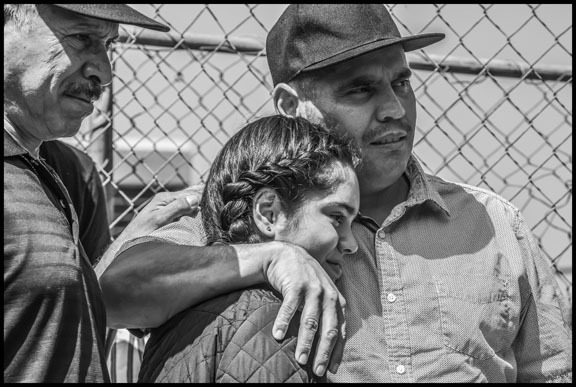 Alexa Lopez hoped her father, Raul, would be released in time to celebrate her quinceñera (15th birthday). 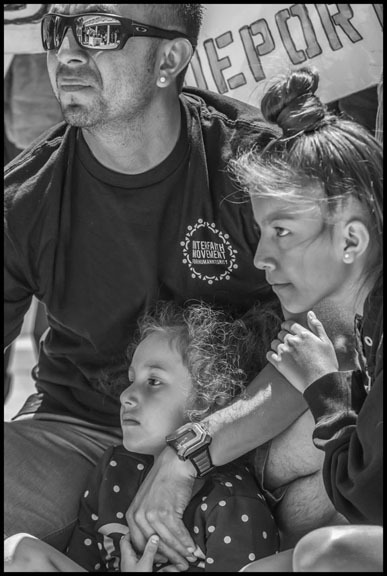 After the Contra Costa County Sherriff announced he was closing the center some detainees were released on bond, but to the dismay of Alexa and her mother, Raul was not one of them, and he was transferred to Colorado. Liliana comforted her niece after she saw her mother for the first time in 8 months. Her mom was not released, however. 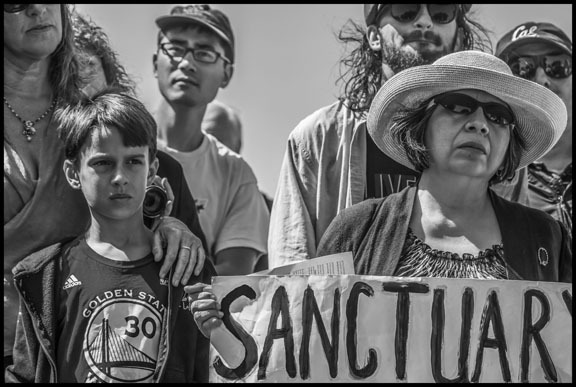 Family members of detainees called on ICE to release their loved ones after it was announced the center would close. Rev. 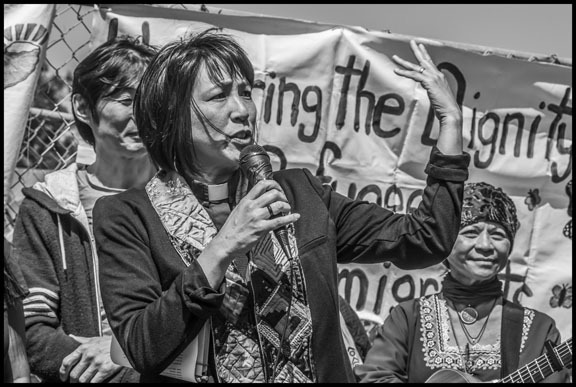 Deborah Lee, the vigil organizer and director of the Interfaith Movement for Human Integrity. Other faith activists outside the detention center the day it closed. 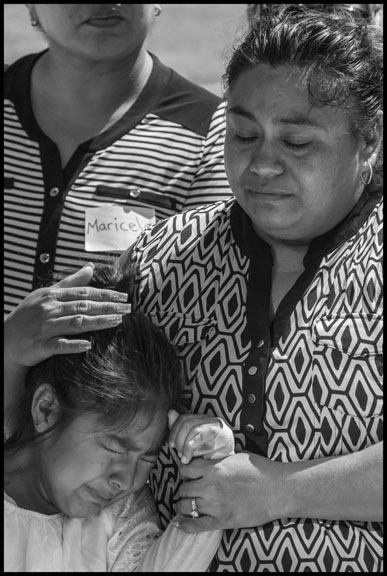 Kara Hernandez and her son Victor Jr. came to the last vigil with her husband, Victor, who had just been released before the immigration detention center was closed. 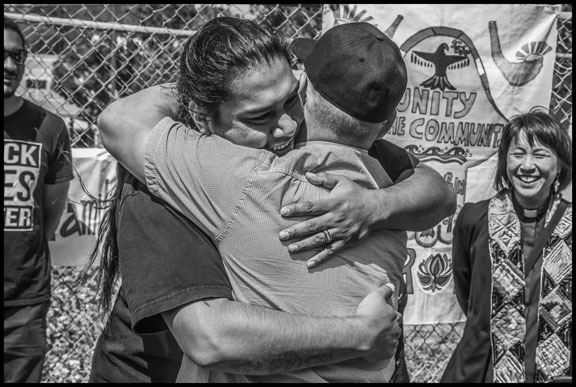 Victor Hernandez embraced Hugo Aguilar during the last vigil, showing the friendship that had developed between them during months inside. Hulissa Aguilar came to a vigil to ask for help to get her father Hugo released. After raising the bond and getting him out, the family was reunited at the last vigil, together with Hugo’s sister Isela and brother Gonzalo. 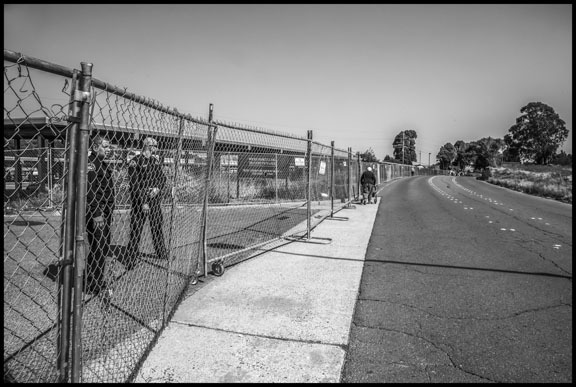 The Sherriff put up a fence to keep vigil participants out of the parking lot and away from the detention center, after he was forced by county supervisors to end the contract with ICE to run it. 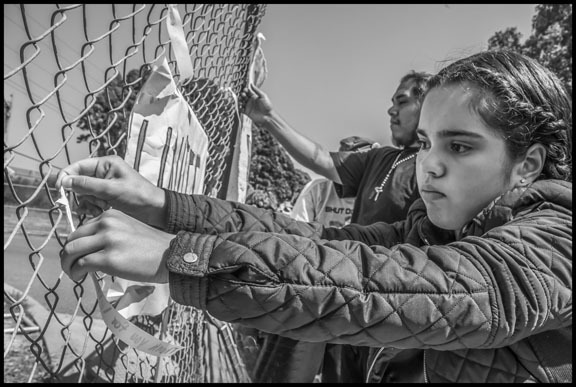 Hulissa Aguilar and Victor Hernandez, along with many vigil participants, tied ribbons to the fence after writing messages on them expressing support for the families of other detainees.